The magnificent island-city of Venice is just a short trip away from Istria. Since it’s carnival season, many bus companies are offering special day trips to the Venice Carnival. This seemed like a good way to experience a little bit of Venice’s famous carnival without having to spend the night in one of its famously expensive hotels, so I decided this was an opportunity I shouldn’t pass up. After booking the trip, I did a bit of reading up on the Venice Carnival on the Internet and didn’t like much of what I read… huge crowds, inflated prices, packed restaurants… What was I getting into? I would have to see for myself. It was pouring rain when we left Pazin at 5:30am. Not a good start! On the way we stopped for a coffee/bathroom break at a service station near Palmanova, Italy. The parking lot was full of buses from all over Croatia, Slovenia and Austria – and the line for the ladies’ restroom was ridiculously long. It was still raining when we arrived at Tronchetto, a huge parking area in Venice which was quickly filling up with buses from all over Europe. We had the option to take the vaporetto (waterbus) to St. Mark’s Square but decided to walk instead. The only way to get around Venice, a collection of over 100 tiny islands, is of course by boat or on foot. Along with its architectural splendour and old world charm, this is one of the unique things about Venice: no cars and water everywhere. From what I had read I was expecting to see crowds of people… and everyone wearing masks and dressed up in elaborate costumes. As we walked along, we did come across many tourists wearing masks, but very few people in costume. Maybe the rainy weather was keeping them away? But there was a tangible festive spirit in the air and a sense of excitement. Colourful masks were on display everywhere, small shops showcased the beautiful Murano glasswork Venice is famous for, and stalls offered fritelle, a sugar-sprinkled fritter made during carnival season (very similar to the fritule we have in Croatia). Once we arrived on St Mark’s Square, the atmosphere was very different. A large stage was set up at one end where a song-and-dance number was in progress featuring people dressed in animal costumes and tottering on stilts. Two huge screens on either side of the stage flashed advertisements, dominating the visualscape. 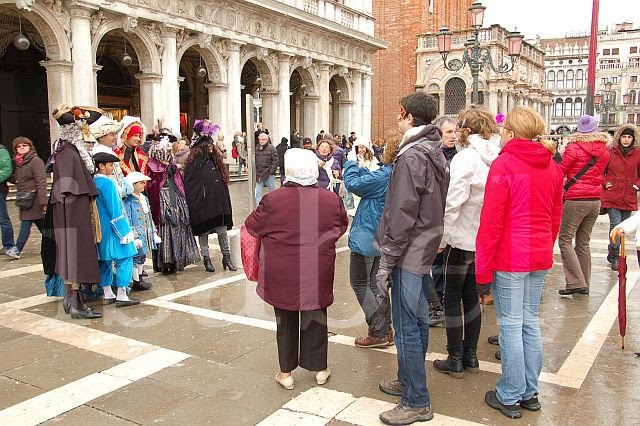 Strolling along the square, there were also quite a few people dressed up in elaborate ‘period costumes’ – who were accosted at every step by a paparazzi of tourists wanting to capture the quintessential ‘Venice Carnival experience’ on their cameras. I was one of them. I noticed that most of the costume wearers spoke German or English and seemed to be tourists themselves. 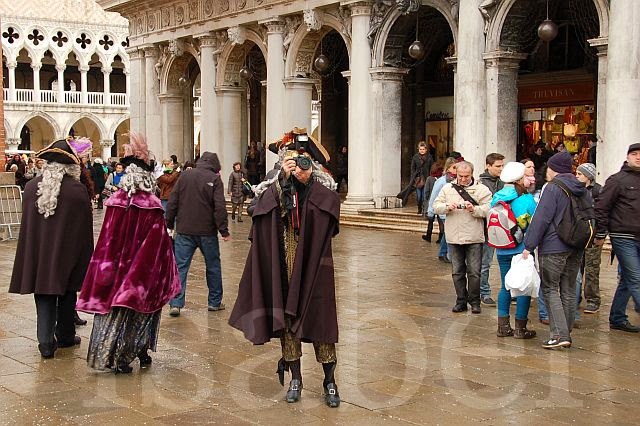 If you love to dress up and have your picture taken, come to Venice during the carnival, you’ll feel like a celebrity! After taking in the beauty of St. Mark’s Square and snapping a few photographs, I just wanted to get away from the circus-like atmosphere and escape back to the charming little lanes of Venice and get lost in them. Thankfully there was some respite from the rain and it wasn’t difficult to find a place to have lunch. I was also surprised to see that prices did not seem to be inflated but quite average for a tourist centre, and nowhere near the ridiculous 4 Euros it costs for a cup of tea in a city like Paris! Would I recommend a trip to the Venice Carnival? 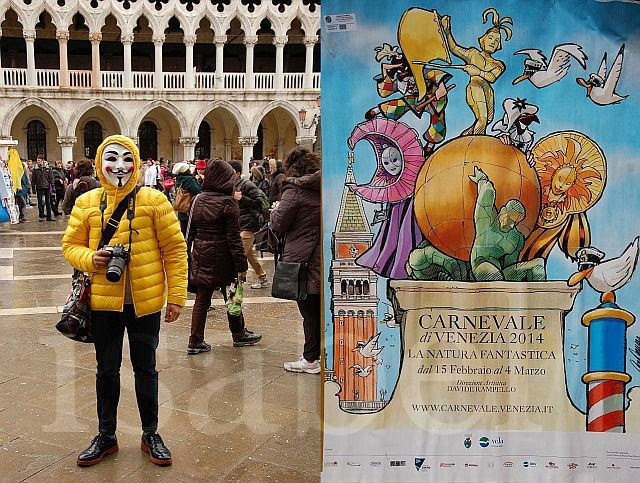 My experience of it was only very limited, but my impression was that the Carnevale di Venezia is less a traditional celebration leading up to Lent, and more of a 'mass tourist event' to attract visitors during the low season. I later came across this article which seems to confirm this and reveals that the revival of Venice's carnival is fairly recent. 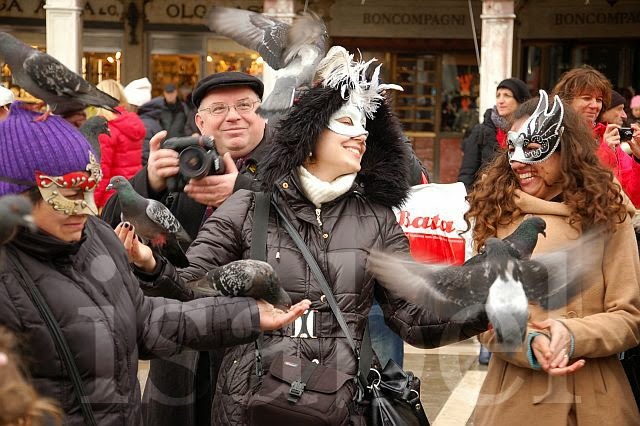 For first-time visitors to Venice, carnival time does offer the unique experience (and photo opportunity!) of seeing beautiful masks and costumes, but the atmosphere seems quite artificial and put on, and lacks 'local flavour' somehow. Venice is definitely one of the most beautiful cities in the world and a 'must-see', but I don't think the Venice Carnival is a 'must-do'. Of course, it’s carnival time in Croatia too, and this weekend I plan to go to Rijeka for the last day of celebrations of what is the best-known carnival in Croatia. I'm curious to see how it compares to Venice's (more) famous carnival, but I am expecting less put-on pomp and more local flavour! Love Carnival it is so much Fun ~ we are in Germany celebrating Rhineland Carnival this year! Love your photos can't wait to hear about Carnival in Croatia! Thank you for sharing! Thanks Stacey. Would love to read about the Rhineland carnival! Seems like a great day - even in the wet. I love seeing the people taking photos in their masks, looks kind of weird and I hope you had a great day in Rijeka today. Big thanks for linking up with us again for #SundayTraveler! Yes, wet it definitely was! Luckily we were luckier with the weather in Rijeka! Great pictures. I have been to Venice before it was lovely and dry but then again I am used to the rain here in London. I would love to see Istria though. 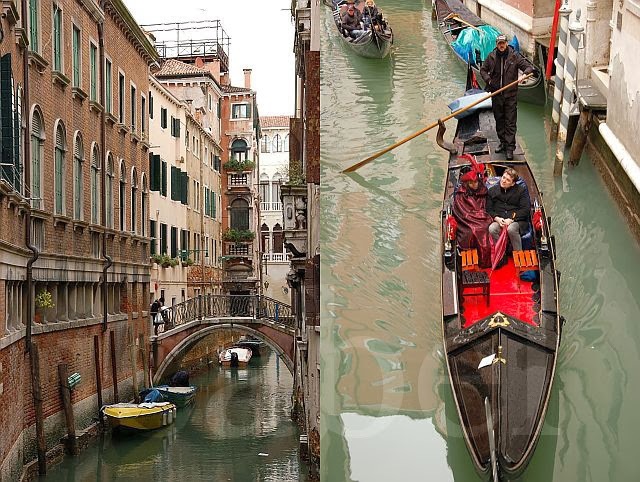 I guess you have to experience Venice in the rain at least once! I enjoy visiting it each time during a different season. Can you send some fritelle to me in Ethiopia? Love the photos - great to experience through your eyes. 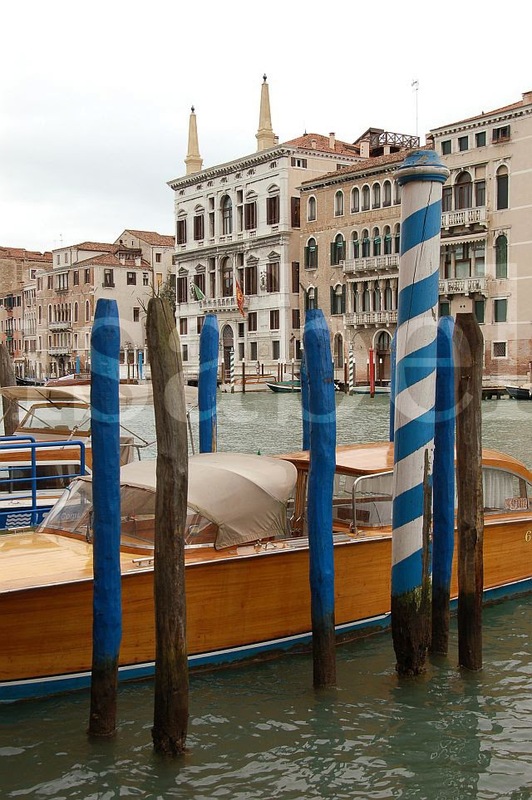 Yes, Venice is a truly magical place and a must-visit! Wow, great pictures. Planning a trip to Venice from Croatia next month. Looks like it will be an interesting adventure. Thanks Shawna. Enjoy your trip to Venice! What you said about the current incarnation of Carnival being more tourist-driven than a traditional local celebration is interesting. I had thought it was the later, probably because I'm one of those tourists they are trying to lure in. I think I may follow the lead of those British and Germans you met and show up in costume, too. I wonder if you can rent them there? I would really like to attend this celebration some day, and your daytrip suggestion sounds like a good one. 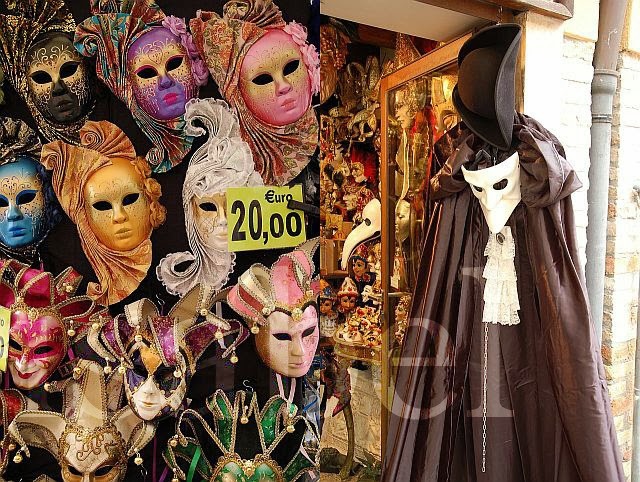 If you like that sort of thing, dressing up could be a fun way of experiencing the Venice Carnival first hand. Yes, costumes are available for rent! 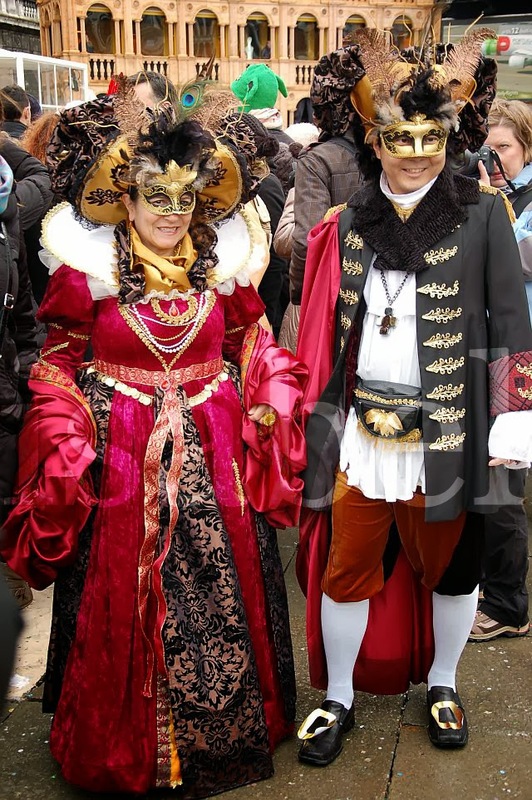 I think to get a feeling of what the Venice Carnival is all about, you'd probably have to spend a few days there. I was told there is no parade, just staged events happening on St Mark's Square as well as organised balls. I'll have a look at your post on the carnival in Nice! Great post and photos! My family is from the region and every year the carnival (and the city for that matter) become less fun and authentic feeling as more and more locals leave the city. It's a shame as it's one of the most beautiful cities in the world and an absolute wonder to see. I've never been there during carnival, but I was there during the build-up one year, and some of the costumes are spectacular! Hopefully the city can figure out a solution and it can improve going forward. Thanks for sharing and safe travels! Thanks for visiting Travis. I think you're right - they are probably fewer and fewer locals left in Venice! Thanks for posting this - I've heard of a few people going to Carnival in Venice and everyone gushes about it - I'd rather hear a more honest review like this. The masks do look lovely but it seems, as you said, a little put on. If it helps, I think Venice is often like that - there is only a very small permanent population without anything to do with the tourist trade, so it really isn't much of an authentic city anymore, and hasn't been for a while. It's still worth a visit though, if only as an open air museum! I completely agree -- historic Venice is more like an open air museum and one of the most visited cities in the world, so it's difficult to have an 'authentic experience' there. But as you say, still very much worth a visit! Even though it's geared towards tourists, I'd still like to see it! Just experience it once and then no more haha. I will make it to Venice one dayy! I've always wanted to see the Carnival season in Venice, but I can't bring myself to choose it over Mardi Gras! It looks like fun, though, even if it's not a must-see.